West Palm Beach, FL (October 10, 2018): Thanks to Florida philanthropist and disabled veterans advocate Lois Pope and the Lois Pope LIFE Foundation, women and men who served in the nation’s military dating back to World War II and who sacrificed to protect America’s freedoms and ideals were treated to a free concert by music legend Tony Orlando on Friday, October 5 at the West Palm Beach VA Medical Center. 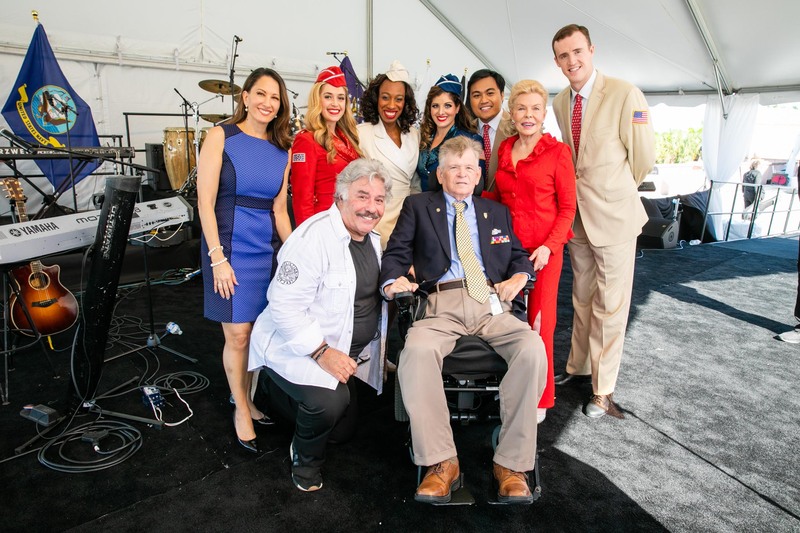 The occasion was the 2nd Annual National Day of Honor for American Veterans Disabled for Life. The world-famous USO Show Troupe, Palm Beach Symphony Orchestra, and Dreyfoos School for the Arts Choir also performed at the concert. The October 5 date has special meaning for disabled veterans in America, as it was on that day in 2014 that the American Veterans Disabled for Life Memorial in Washington DC was dedicated. The Memorial was the brainchild of Mrs. Pope, a Manalapan resident who conceived and spearheaded the building of the nation’s first and only permanent public tribute to the four million-plus living American disabled veterans and those who have died. Following the Memorial dedication, Mrs. Pope spent the next two years championing the creation of the National Day of Honor for American Veterans Disabled for Life, to be held every October 5. She worked with U.S. Rep. Lois Frankel (D-FL, 21st District), whose son served in the U.S. Marine Corps, and who introduced a resolution into Congress to officially designate the day. The resolution was contained in the U.S. Rep. Jeff Miller and U.S. Sen. Richard Blumenthal Veterans Health Improvement Act of 2016. The Inaugural National Day of Honor was held last year at the Memorial. In her remarks, Mrs. Pope, who has also developed and produced two PBS documentaries on disabled veterans in America, expressed special gratitude to two disabled veterans whose efforts went a long way to seeing that the Memorial became a reality: Jesse Brown, the now late Secretary of Veterans Affairs, and the now late Sen. John McCain. Mr. Orlando also spoke about Sen. McCain. He explained that the legendary Bob Hope called him to perform at the Welcome Home POWs Concert at the Cotton Bowl in Texas more than 40 years ago. As he sang his iconic song, “Tie a Yellow Ribbon ‘Round the Old Oak Tree,” he noticed that the thousands of veterans and former prisoners of war in attendance were all clapping along, except one. That moment began Mr. Orlando’s four decades-long commitment to the Vietnam POWs and veterans of all wars. Indeed, he has been honored with the prestigious Bob Hope Award for excellence in entertainment from the Congressional Medal of Honor Society in tribute to his efforts on behalf of veterans. His commitment to veterans led to his being named Honorary Chairman of the 40th Anniversary at the NAM-POW’s Homecoming Celebration at the Richard M. Nixon Presidential Library in 2014. He also serves on the Board of Directors for the Eisenhower Foundation as well as Honorary Chairman of Snowball Express, an organization that serves the children of fallen military heroes. Orlando also hosts the Congressional Medal of Honor dinner every year in Dallas, Texas to honor our Medal of Honor recipients.